I have attempted to install and run this plugin, RSS Feed Poster, however, I have been unable to get this plugin to work right. I did try contacting the author, but he seems to have abandoned the program. The responses that I did get from the author were "you need to pay me to fix this plugin". What?? That doesn't make sense for a free plugin that he created. Other users have chimed in the thread (here in MyBB.com) and basically said the same thing that I said. Anyways, is there a way that you can fix and install this RSS Feed Poster for my website? Oh yea, I have NO idea what this means, this plugin "Requires any of the following fopen, curl, fsockopen". 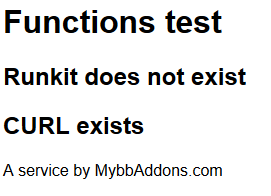 I did a test using the functions_test.php and I got this result. Hi Serpius, I don't know how RSS Feed Poster work but I don't plan to create plugins for which there is already an alternative available, unless they prove to be unusable. If you want to chime some money in, you may ask its author which as you said required some bucks for him to fix the problems you are having. Might be good to have a detailed list of issues you are having with it too. I don't offer support for others' plugins, but if your issue turns out to be obvious, I may give you some quick advices to fix it. PS: fsockopen, fopen and cURL are all PHP methods used to communicate with external links – which is something mandatory to read external RSS feeds. Like I said, the author has abandoned the program. There are no updates or fixes. If you can't do this, that's fine. I was asking. Oh well, didn't read your post properly then. If you can manage to list your issues with more detail, I can look into them and see what I can do.